Video, 3 min. 30 sec. Video, 26 min. 18 sec. The face is the part of our body that we mostly associate with our identity, with which we express feelings, and from which we attempt to read the feelings of others. 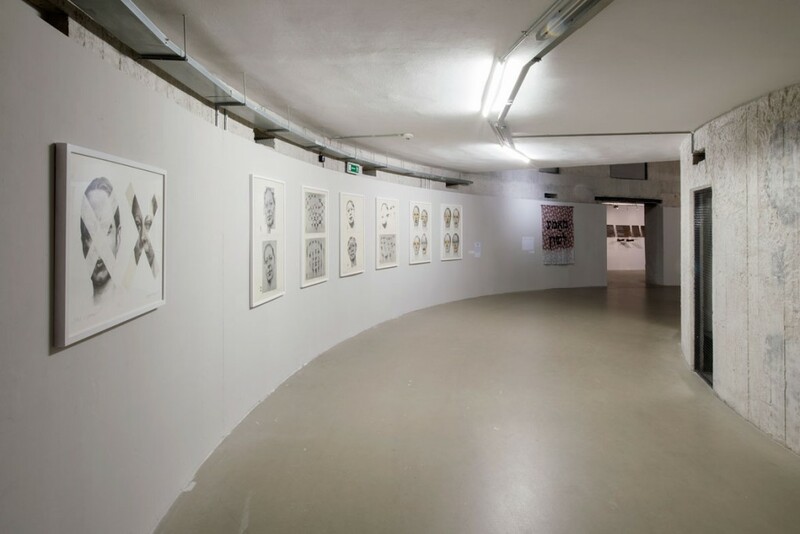 The ‘exercises’ of the Polish artist Krystyna Piotrowska appear as experiments in which someone artificially ‘assembles’ and changes an identity using fragments, superimpositions, and clichés; melancholy is inscribed in the result of these attempts: The faces are inevitably distorted and exposed to the eyes of the viewer in this ‘injured form’. Why do we find her drawings oppressive? The cause of the overlaps and intersections seems to lie less in an overabundance of identity drafts than in a strong discomfort or an existential shock. We know that we are fragile, but do we want to face this fact? The face decomposed to nose, mouth, and eyes, or according to a schematic grid, is fatally reminiscent of the race-theoretical insanity that had an effect on the human sciences and popular scientific publications from the 19th century up until the 1980s. In the Nazis’ pseudo-scientific propaganda. 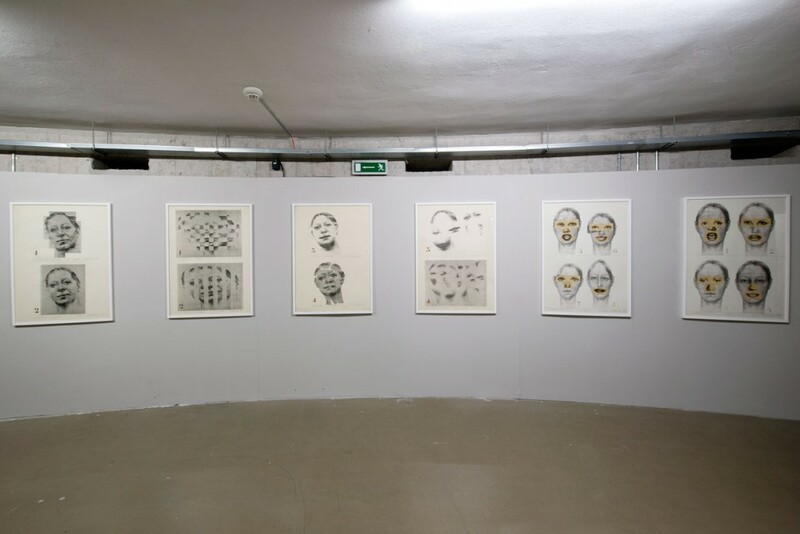 the so-called ‘race atlas’ was issued as teaching material and contained large-format plates with captions such as “The soul of the race speaks from this face.” Piotrowska’s works still described the trauma of the repercussions of these ideologies in the early 1980s. 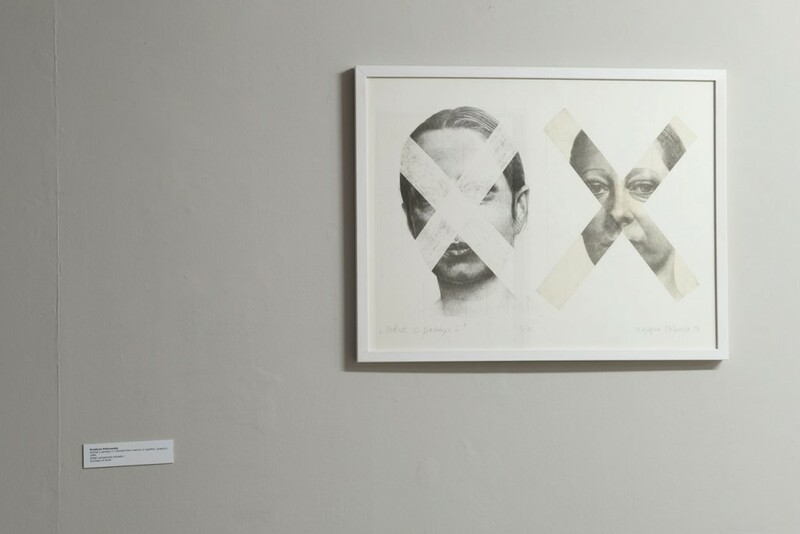 One of the lithographed portrait drawings, Portrait from Memory, is crossed out by two strips that obliterate the essential traits—eyes, nose, mouth—and rob the face of its identity. Next to this drawing, are the two adhesive strips with the missing fragments drawn on them. 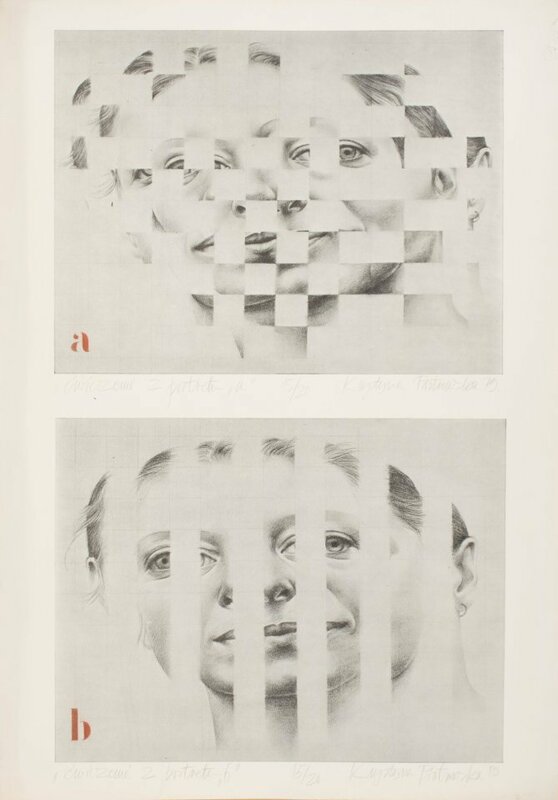 The viewer can put them back together and gain a complete picture of the person. Her video work Yoga 1, Yoga 2 also stands in the tradition of the portrait. The artist’s brother is recorded performing yoga exercises in an extremely disciplined manner. The off-screen voice supplements the images in the style of a profile giving important information on his personality and identity, things we cannot see. 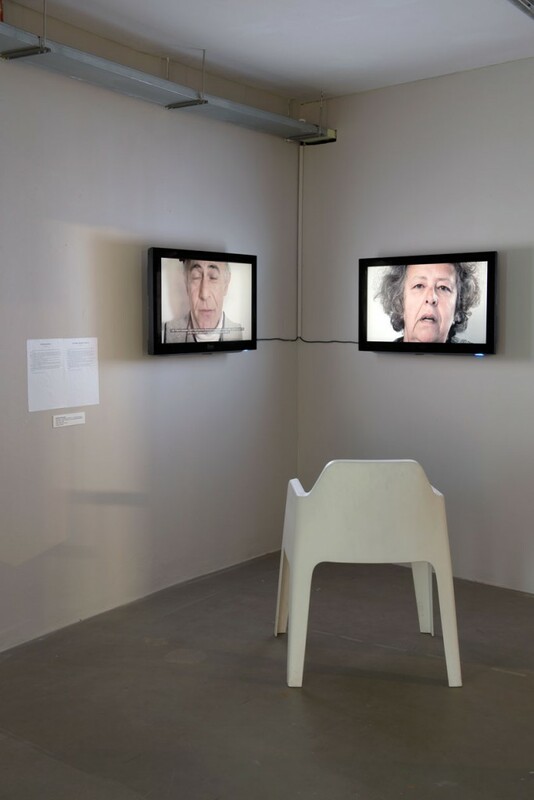 It becomes evident in this portrait how strongly identity is the subject of personal decisions and everyday life; at the same time, the video gives an impression of the force of external attributions in regard to one’s own identity and bears witness to the shocking existence of current anti-Semitic attitudes in society. 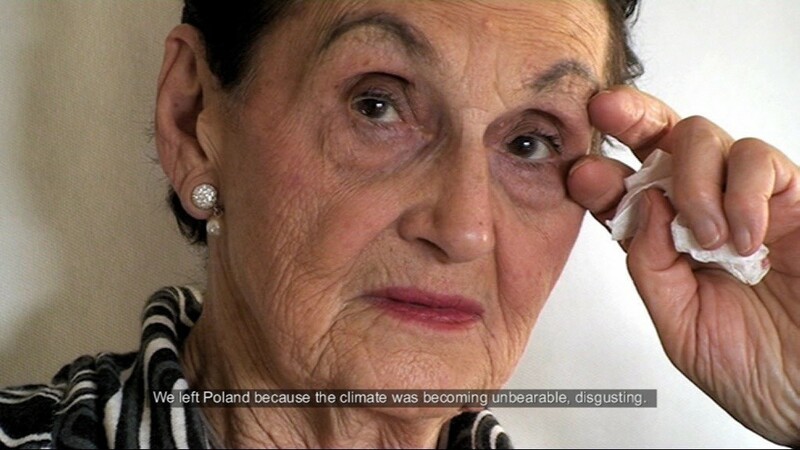 Krystina Piotrowska’s video installation I left Poland because… is a two-channel video installation showing a close-up shot of a person uttering sentences beginning with “I left Poland because…”. On the left, the person speaks in Polish, on the right, the same person speaks in different languages representing countries to which he or she has emigrated. When the person is speaking on one side, the other half of the installation is frozen. 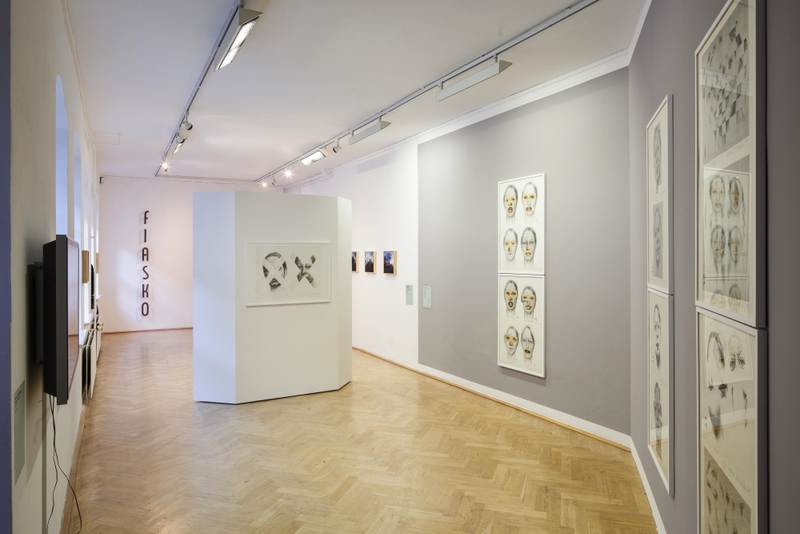 The work refers to the anti-Semitic campaign in Poland in 1968 which was officially initiated by the communist party. Officially declared a as “a fight against Zionism,” the campaign politicians tried to get rid their political adversaries by accusing them of connections with Israel and the global Jewish Diaspora. Jewish clubs and schools were officially disbanded. University professors and students were expelled; officers, civil servants, journalists, and medical doctors were dismissed only because of their ethnic origin. At the same time, the authorities officially appealed to the Jews to leave Poland. In the years 1968-70, about 13,000 Jews emigrated from Poland. They had to relinquish Polish citizenship and leave everything behind. Krystyna Piotrowska describes the disruption caused in the self-understanding of many who fled the country: “People who left were not only the ones culturally or religiously related to the Jewish Diaspora, but also people who so far had regarded themselves as Polish and yet who were denied the right to be Polish.” The film I Left Poland Because… was made on the 40th anniversary of those events. Krystyna Piotrowska (* 1949 in Zabrze) studied at the Department of Interior Design of the Academy of Fine Arts, Cracow, at Higher School of Fine Arts in Poznán and at Grafikskolan Forum in Malmö. She lives and works as an artist and curator in Warsaw.